Summary: God promised to never destroy the earth with water again. He gave us the rainbow as a reminder of his promise. We should keep our promises just as God keeps His promises. 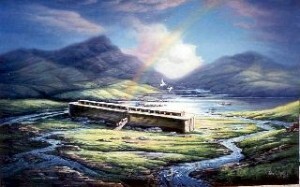 God brought the ark to rest on the mountain on the same day that became Easter later. It was a beginning of a new world and new life. The old world had been swept away by the great flood. Noah and his family came out of the ark into a new world. Noah built an altar unto the Lord and sacrificed burnt offerings. Most people would curse God if he destroyed everything, but Noah was grateful that God had spared him and his family. The Bible says that God realized that man would remain sinful, so he decided never to curse the ground for man’s sake, and never to smite every living thing again as he had done with the flood. So God made a promise to never destroy the earth by a flood again. When God makes a promise, he keeps it. As a sign of his promise, he placed the rainbow in the sky whenever it rained. Have you ever made a promise? Did you keep your promise? With people, we might forget what we promised or break our promise. If you tell someone you are going to do something, you need to keep your word. That is called integrity. A Christian should be able to keep his word of honor. God’s sign that he would remember his promise was the rainbow. Have you ever seen a rainbow? Did you ever wonder what a rainbow was made of? It is made of light. In fact, it is made of seven colors of light. It only occurs when it rains. The light of the sun shines through the rain, causing the light to bend (or refract) and reflect off the rain. The rain acts like a prism, splitting the white light into the colors of red, orange, yellow, green, blue, indigo (deep blue), and violet (purple). They always stay in the same order, because the frequency is from low to high. It always forms an arch. Does this sound like something God made? Yes, it is very orderly and dependable, just like God. Jesus is like the rainbow to us: when God sees us and our sin, he sees us through Jesus, who said “I am the light of the world.” (John 8:12) God doesn’t see our sin due to the sacrifice Jesus made for us on the cross. But as the days of Noah were, so shall also the coming of the Son of man be. For as in the days that were before the Flood they were eating and drinking, marrying and giving in marriage, until the day that Noah entered into the Ark, and knew not until the Flood came, and took them all away, so shall also the coming of the Son of man be. Let’s be ready when Jesus returns. Don’t miss the boat!